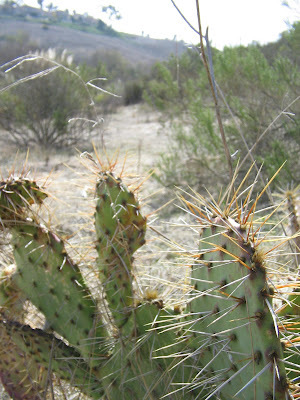 Photo: A prickly pear cactus growing in Salt Creek Regional Park, outside my apartment. The theme of this blog is "Recipes for Celestio-Faunal Adventures", but somewhat tangentially to this theme, here's more like a recipe for a good dinner instead. While preparing a lesson on U.S. geography this afternoon, I was reminded of the fact that although I live near the ocean, I also live in the Southwest--a desert clime. I think some combination of this thought, as well as the 75 degree (F) temperatures today and beautiful light of the sunset reflecting on the arid Santa Ana Mountains, have put me in a very "southwest" mood. Accordingly, for dinner I decided to throw some chicken on the skillet, seasoned with Mrs. Dash's Southwest Chipotle blend, topped with a medium-spicy, chunky salsa. For a side dish, I steamed up a blend of corn, poblano pepper, red pepper, and onion. And to drink, my favorite beer of late served as an excellent complement: the Mexican dark beer, Negra Modelo. And all of this required very little time and money, so here's three cheers for this dish. Damn, I could write for Martha Stewart Living with this stuff. By the way, next time I go to make this, I'm thinking of marinating the chicken in spices and tequila overnight. I'll post an update as to whether that winds up being a good thing.